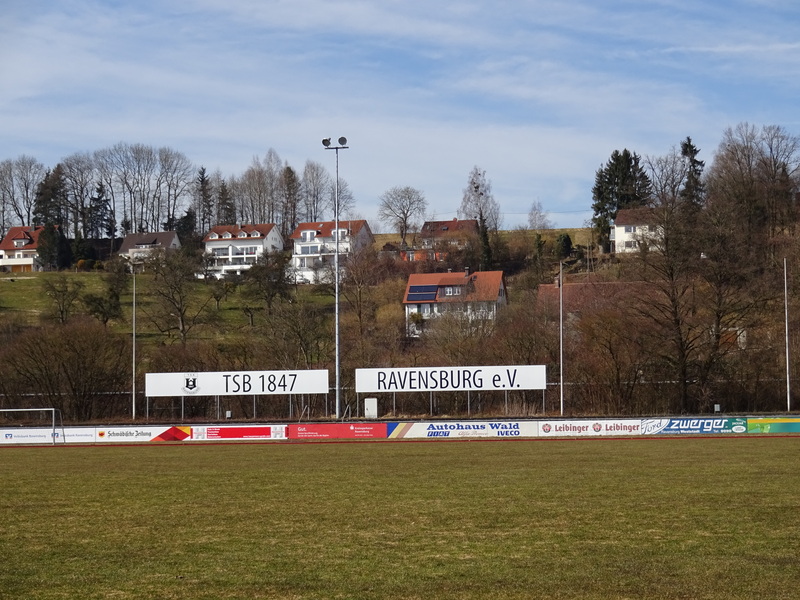 Football isn’t always beautiful and yesterday afternoon’s opener against the Holzgerlingen Twister, at times, was very ugly. But, ugly or pretty doesn’t matter if the score’s in your favor at the end. It was, so this cold, wet and sloppy Sunday was a great day to be a Razorback. Before I describe the game, a little bit about the atmosphere. 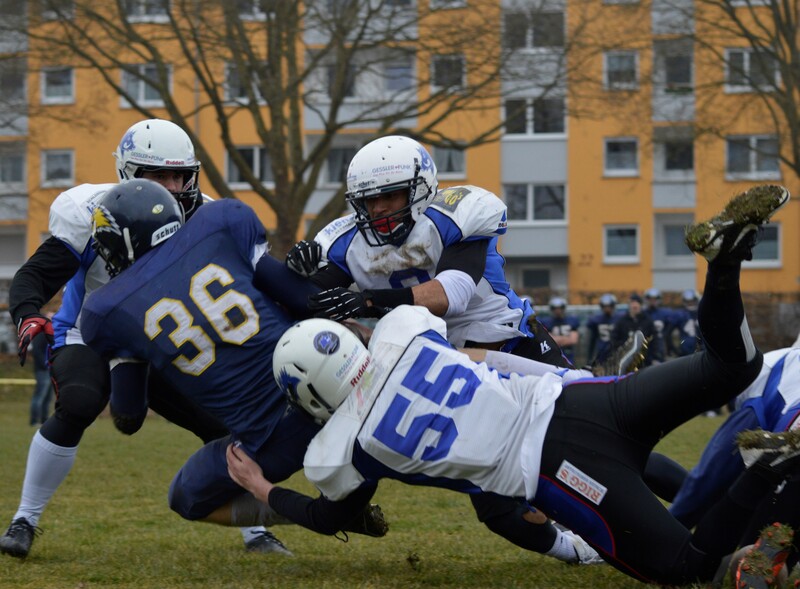 It shouldn’t come as a surprise that a football game in Germany has a different feel than in the States, but the disorientation started early. 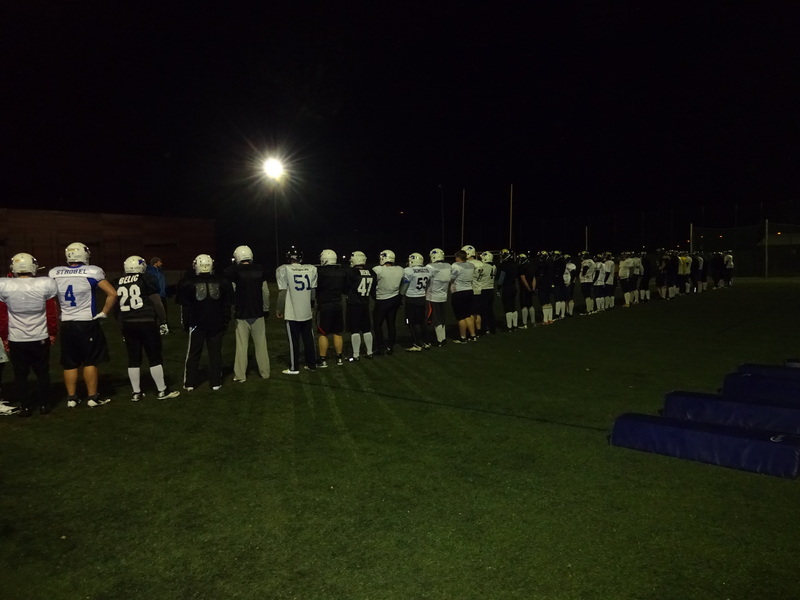 The players line up numerically for a “pass check” where each player’s paperwork was compared to the actual player. “Typical German need of rules and order,” I’m told by several Razorbacks. Razorbacks lining up for the player pass check. The crowd was likely kept down by the weather, but I was struck by how quiet everything was. 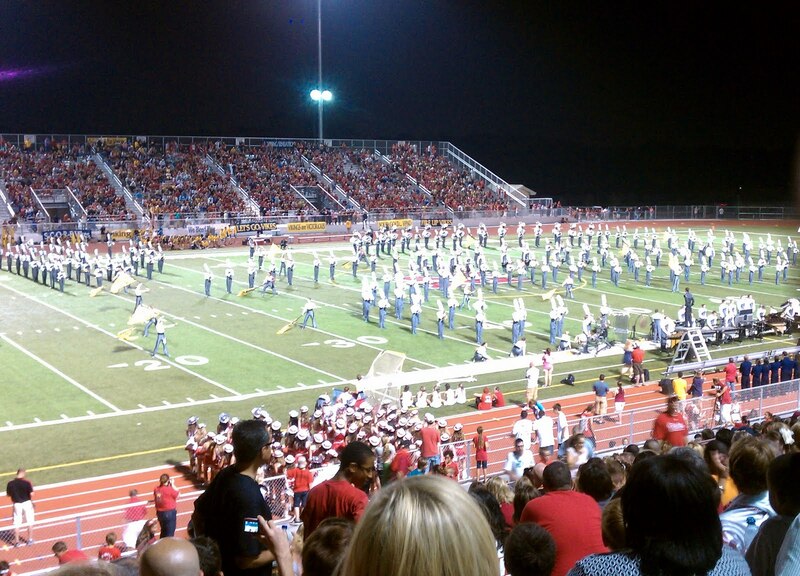 No bands, no PA system announcing play outcomes, and except for big plays, no fans cheering. I could hear the QB and defensive calls, I could here the pads popping and the players grunting and straining as though I was at a practice. The strangest thing of all though was the absence of a game clock…more on this later. The first half was frustrating. We were unable to get anything going, often getting into 2nd and 3rd and long situations; Tough spots when we hadn’t established much of a running game, and the defense could commit to stopping the pass. Luckily, our defense played just as well as theirs and we went into the half tied 0-0. The game changed in the 3rd quarter. After another defensive stop, we gain 6 yards on a inside run…(2nd and 4!!!) On the next play, a nicely thrown pass across the middle to receiver Michael Mayer and a tough run after the catch and we’re finally on the board: 7-0 Razorbacks. Another three and out, a blocked punt, recovered on the 2. A short field leads to a quick score: 14-0 Razorbacks, just like that. Michael Mayer outrunning a Twister defender for the first score of the day. 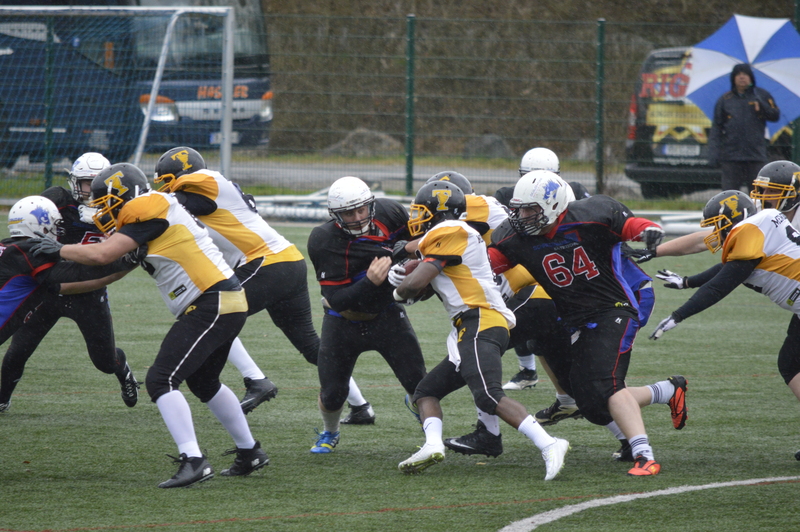 The Twister threaten, moving the ball deep into our territory before fumbling on the one yard line. What followed is something I’ve never seen before, a 20 play 97 yard drive…but no points. We finally get into a rhythm , running inside zone repeatedly, and grinding all the way to the Twister 2-yard line before a holding penalty stalls the drive. After a third down incompletion, the head coach tells me I might as well call a 4th down play because less than two minutes remain. This is how I find out the game is effectively over. Without a clock, I hadn’t realized that we’d run out most of the fourth quarter. The failure to convert is disappointing, but the 20 play drive was the most rewarding series of the day for the Razorback offense. Final Score; Razorback 14, Twister 0. Winning is winning and though the surroundings are unfamiliar, the feeling of exhilaration and relief isn’t markedly different than in the States… We were sloppy, but the Twister is supposed to be a good team and we definitely won the 2nd half and showed glimpses of what we can do. It’s also rewarding for a coach when all three side have significant contributions. The defense gave us a shutout, the special teams gave us a short field by blocking a punt and the offense iced the game with a long drive. 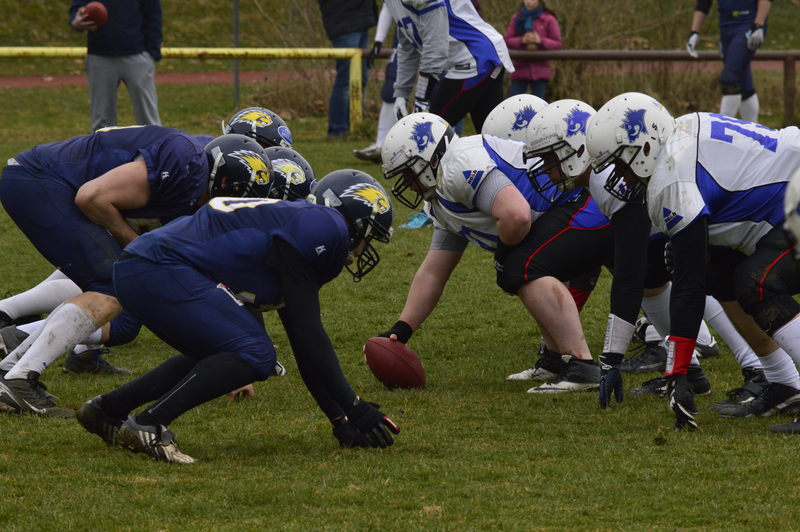 Now, we have three weeks off until our first league game against the Pforzheim Wild Dogs. Enough time to fix some of the problems we saw today. Razorback defense swarming to the ball. I received this comment this morning in response to yesterday’s post. Thank you Coach Petrich. 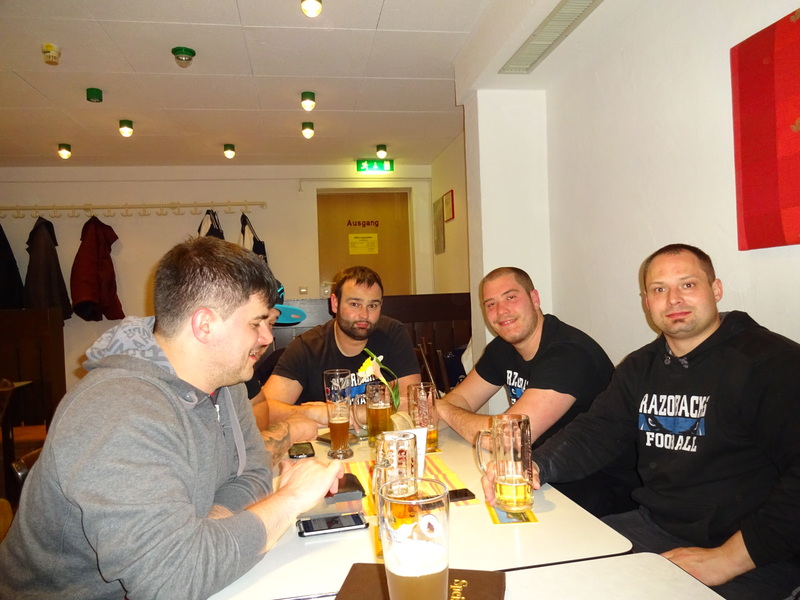 I am an absolute rookie to Euro football, and look forward to seeing this aspect of gameday… Interestedly our HC,Thomas Miller told me that it was the friendly, party-like atmosphere of going to Frankfort Galaxy games during the NFL Europe years that got him hooked on football. The contrast of the fan experience between American football and soccer is an interesting angle I hadn’t considered. Thanks and I hope you keep reading my posts. Outstanding reflection on the joy of playing football in Europe! I coached a lower division in Finland (1988 ); on the European Champs in 2001 ( Italy ); on a budding Innsbruck team in 2002 that won the European Championship in 2009; and in Sicily in 2009. 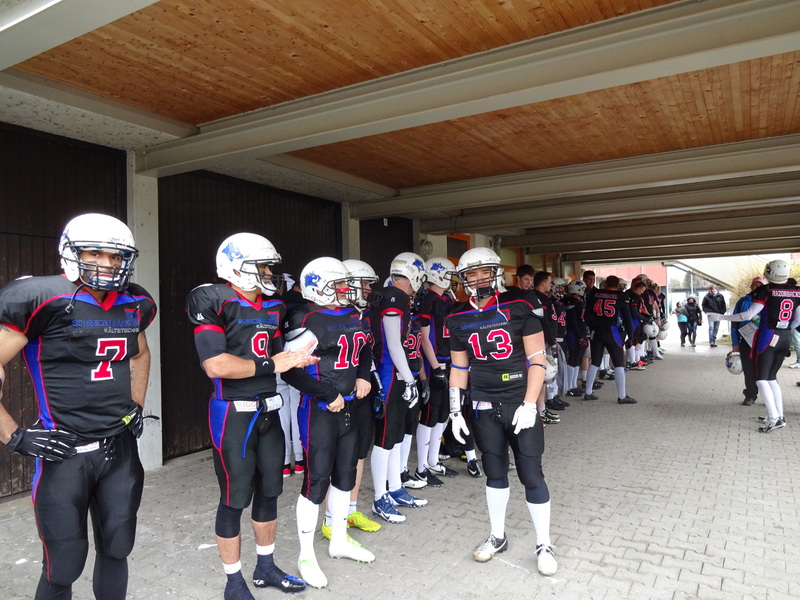 The reelections here-in are mostly right on: But, I would add, most players who enjoyed and stayed with the American Football, felt they were a special fraternity due to different expectations and challenges in the sport. I have to call this a “self imposed” expectation toward character building. Let me explain. In every country I coached, the female fan base was part of the various forms of sociability at games via European adaptations of what we call “tailgate parties”. Men came to games with dates, and stayed to socialize at a set up social after game affair, maybe at the stadium ( with the other team invited). This was is a character building aspect of American Football, in its own right! That very same stadium most likely was a soccer (“real football”) stadium, which when soccer games were played, restricted fans from intermingling at all before or after the game: With even locked gated separating players and officials on the field, from the fans in the stands. Indeed, one big reason the women liked attending, and even offered to be cheer leaders, was because they felt safe and welcomed in stadiums they would never go to otherwise. I, myself, never considered taking a date to a big soccer game in any of the European cities where I coached due to the un-sportmanlike nature of the local male fans. So, I think their is a very big expectation among supporters of American Football, both players and fans, to instill a different character to sports participation than they have very often experienced in Europe. Razorbacks and Beavers line up before scrimmage. Sometimes it takes getting some distance to see things right in front of you. 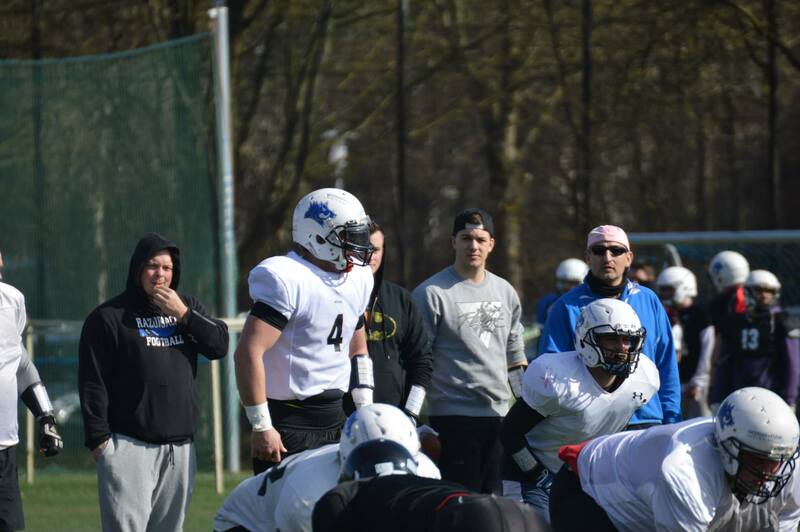 Coming to Europe showed me what American football is really about in the United States; money or character training. In the NFL and major colleges, the game isn’t a game but a business. Players and coaches may or may not enjoy what they do, may or may not derive higher meaning from the struggle, all that truly matters is success on the field and, by extension, in the pocketbook. Winning leads to ticket sales, TV contracts, higher salaries and promotions for coaches. D-1 college players play for room, board, tuition and to increase their NFL draft status…Money. In high schools and lower college divisions, the game is a teaching tool to supplement classroom learning; teaching teamwork, discipline, commitment, delayed gratification, toughness and responsibility. I often remind my HS players that football skills are absolutely useless in the real world but the process of gaining those skills teaches character that can be transferred to any aspect of life. I strongly believe in this mission, as my on-field education shaped me more than all the math, science and social studies courses ever did. In the US, football is never about football, it always serves another purpose. In Europe, the motive is much simpler. People play and coach because they love it. There is no real money in the European game. Although the game can be loosely described as semi-pro, most players and coaches here pay for the privilege of playing. The clubs themselves likely pour every Euro made in endorsements, ticket sales etc straight back into building the programs. Europeans don’t expect their schools to teach values. This seems to be an American idea. They also don’t connect character building to sports. Sports are about fun and exercise, not work, teamwork or discipline. If a player has to miss a practice because of a business trip there’s no guilt about “letting the team down” or “lack of responsibility.” These are grown men with other responsibilities and families. For me, it’s a refreshing change. I don’t have to worry about “building men” or outlining the life lessons taught by the struggle. I simply coach the guys who show up. It’s common for our players to light up cigarettes after practice. Friday night a player brought several cases of beer for everyone to share directly after our scrimmage with the Biberach Beavers; things that would be unheard of in either a US school setting or a money-making program, but normal here. Although character building isn’t the goal of Euro football, the very nature of the game does build character whether intended or not. Football only works when players sacrifice for the team. It only works when players prepare for a handful of games by committing to long off-season training. It only works when player have the discipline and toughness to push through pain. Our head coach told me of how recovering from an injury and returning to the field taught him that reaching goals is possible if you work hard. He said the experience changed his life. While life changing is not the mission in Europe as it is in the States, the process teaches values regardless of the continent the game is played on. 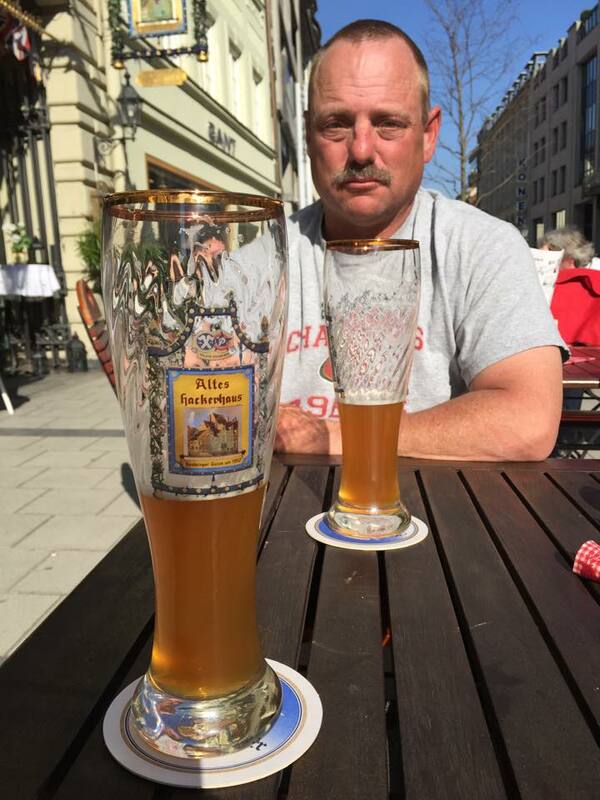 …Meanwhile back in Texas, I was sad to hear Steve Warren is retiring as the head coach at Abilene High. I spent a week with Warren and the Abilene staff in 2012 as they prepared for the cross-town rivalry game against Cooper. I loved the West Texas high school football atmosphere and was impressed by the professionalism and demeanor of the staff. The resurgence at Abilene High was not an accident but is much due to the man at the helm. As with many of the programs I highlighted in Big and Bright, Abilene High is a great representation of what is right and good about Texas High School Football. Warren is a quality man who coaches the right way and his retirement from the coaching community is a loss to the profession. I am glad to see that he will be succeeded by long time offensive coordinator Del Van Cox, another good man who will keep the ball rolling. Good luck to both Coach Warren and the Abilene Eagle football program. I look forward to visiting in the fall. 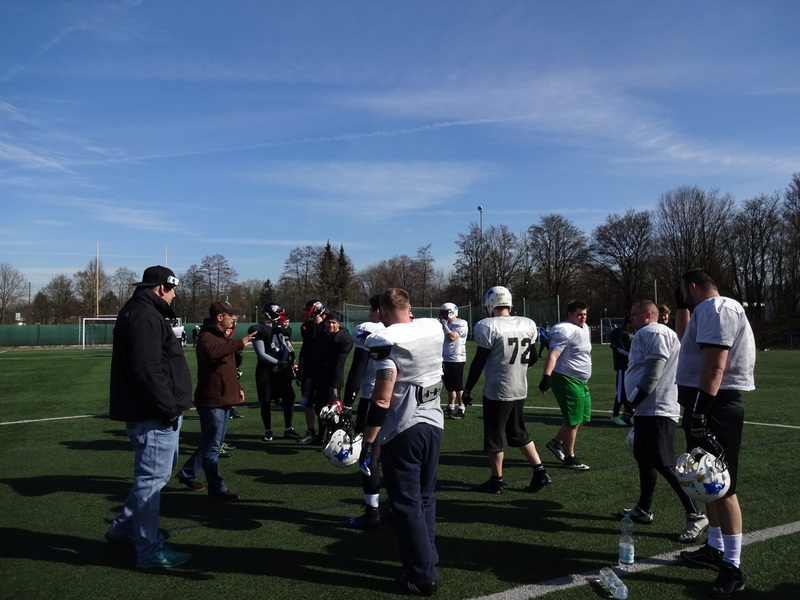 With a grueling schedule of two practices a week and possible games or scrimmages on Saturdays and Sundays, Mondays and Tuesdays effectively become the weekend for American coaches and players in Europe… (sometimes much longer with bye dates. This leaves plenty of time to see the sights. 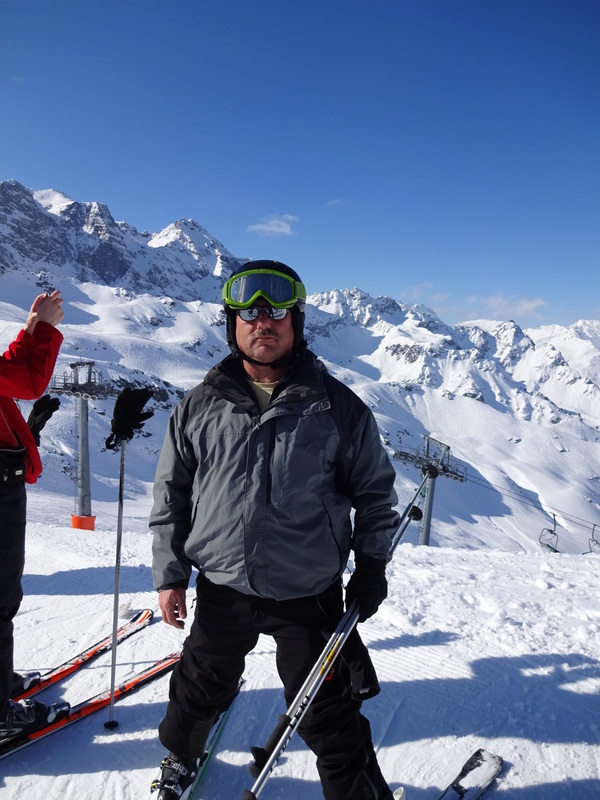 Saturday, I couldn’t resist the mountains and took a quick drive into Austria to do some skiing in the Tirolean Alps. I’ll be skiing with Head Coach Thomas Miller on Thursday… but who knows when I’ll get another chance to hit European slopes? I’m a ski instructor during the winter and there are few things I like as much as getting to the mountains. 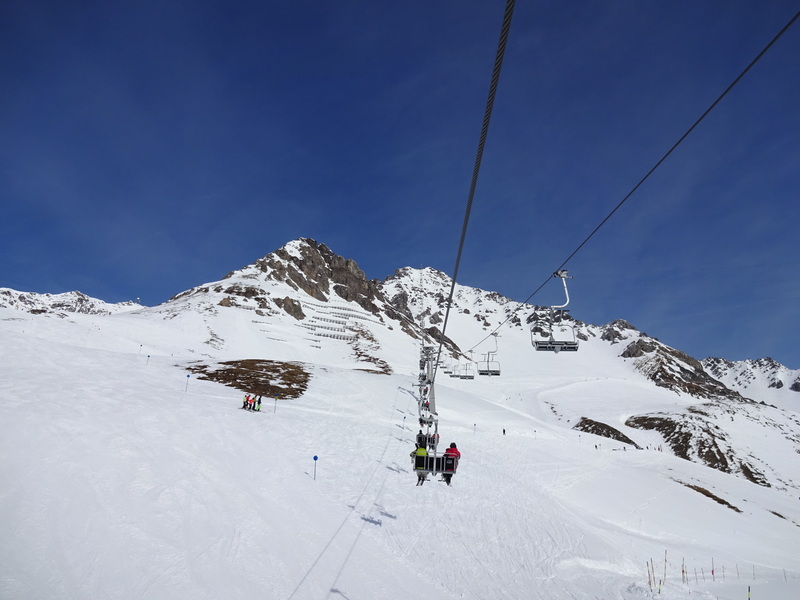 Arlberg has a vertical drop of over 4000 feet, making for some spectacularly long runs. The mountain and the weather were both beautiful. 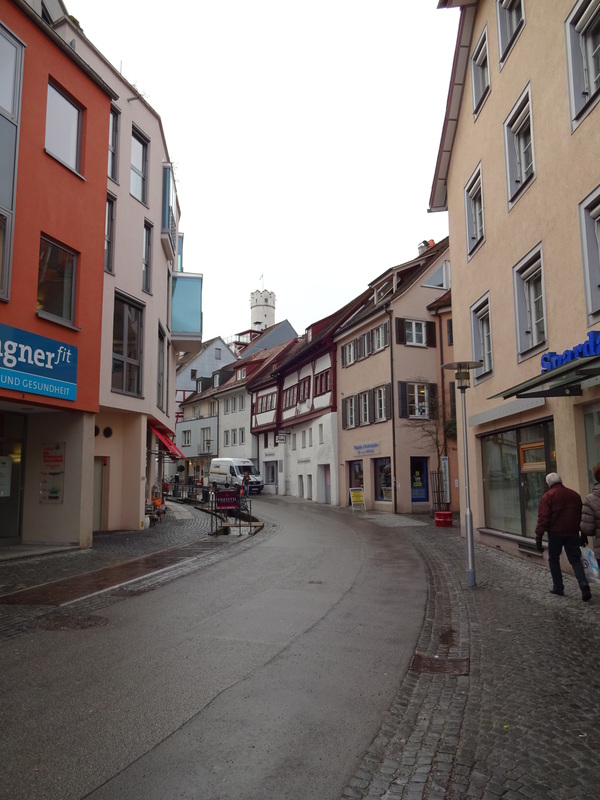 Today, I drove to Munich to visit an old friend from my hometown who just happened to be in Germany for business. 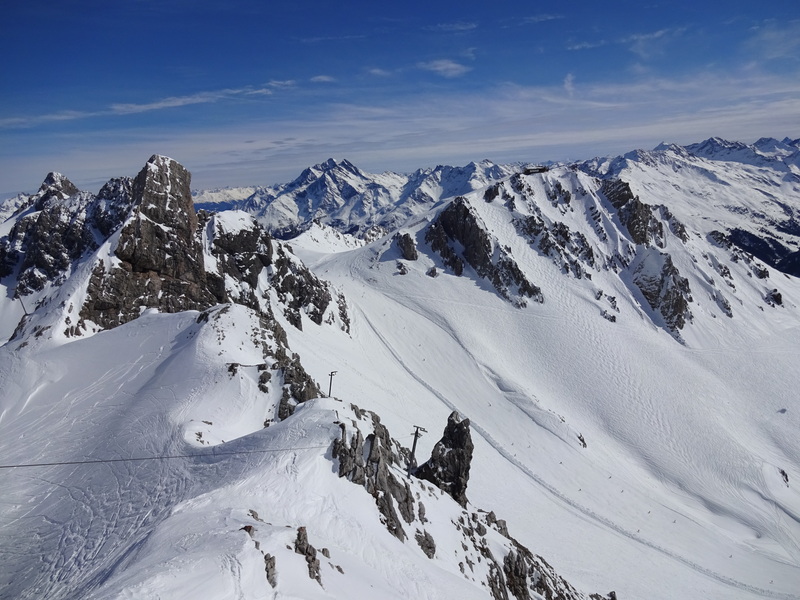 It was a weekend of firsts for me… first Alpine skiing, first driving on the unlimited-speed Autobahn and first visit to Munich. No speed limit driving isn’t as scary as it sounds. German drivers are so disciplined and predictable that it just doesn’t feel dangerous. Left lane is for passing only. Passing is never in the right lane and slow traffic never block the fast lane… Simple rules so many American drivers never seem to grasp on our Interstates. Despite going around 100 MPH (160 KPH) in my VW, BMW’s and Mercedes blew past me like I wasn’t moving at all several times. 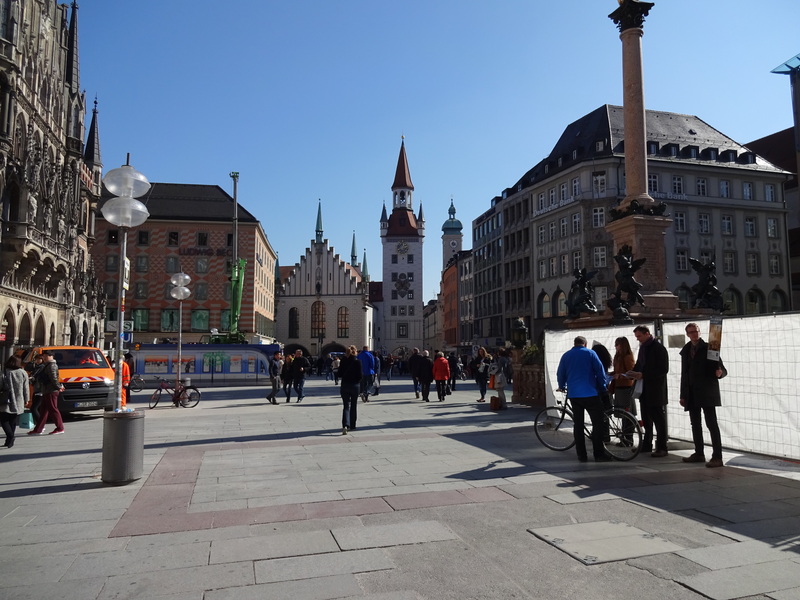 Munich’s downtown area was wonderful. 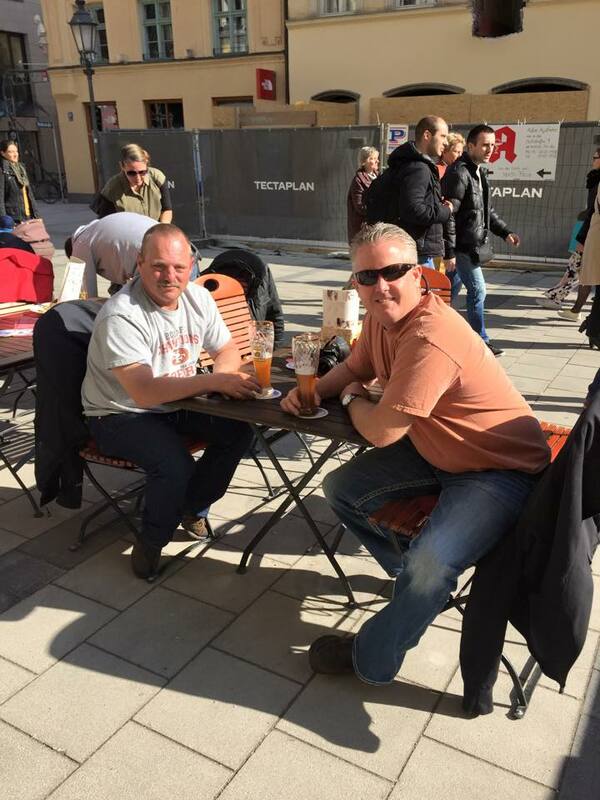 Peter and I had a nice lunch and a few beers at a cafe near the city center. Food, drink and company were all excellent. It was great to catch up with someone I’ve known so long in a place so far away from home. I really enjoyed Munich and wished I could have stayed longer, but I’m sure I’ll make it back again during the next four months. Back to football tomorrow. 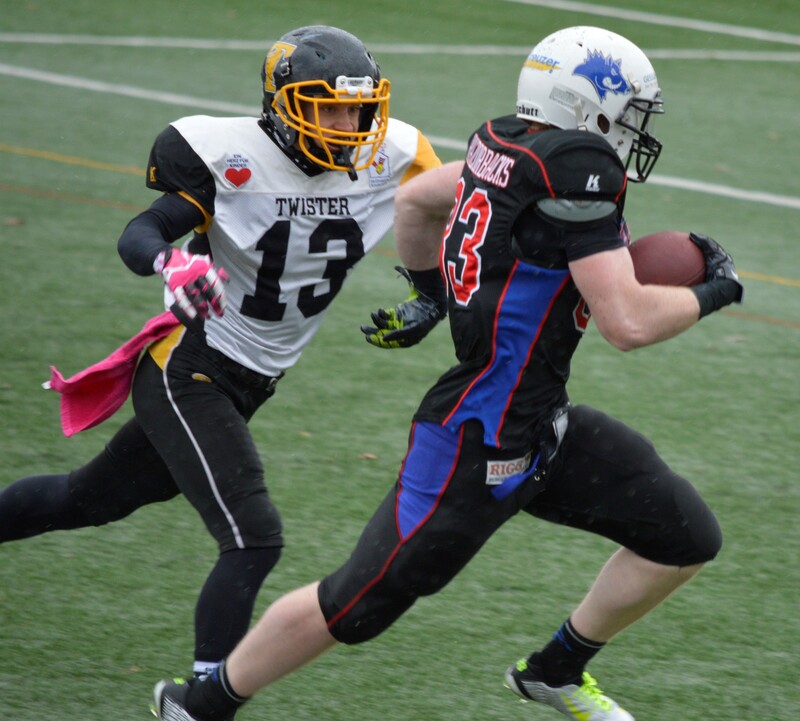 Only 19 days until our first game against the Holzgerlingen Twister!!! 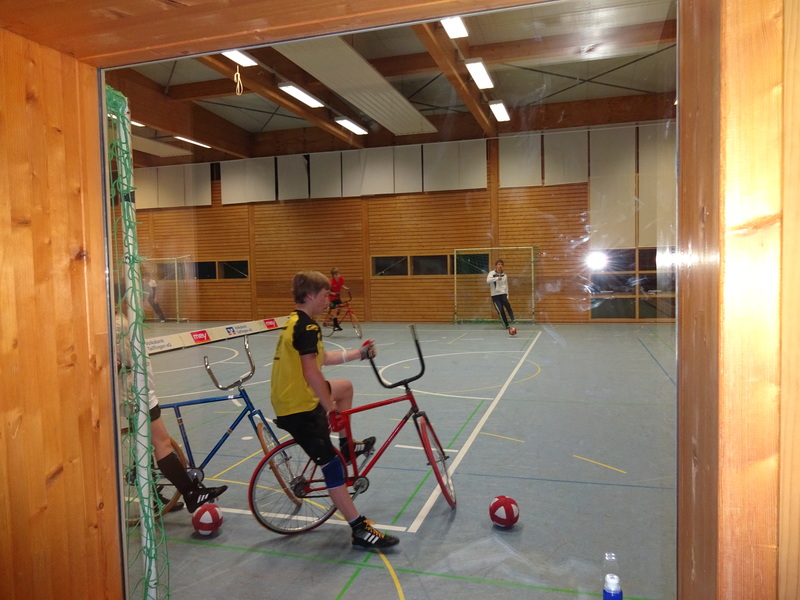 We just finished a two-day camp with the Tübingen Red Knights. The Red Knights play in the 4th division. German football is split into six divisions. Like European soccer, the divisions are fluid, with the best teams moving up and lower teams moving down. My team played in the 2nd highest division last season, but voluntarily moved down to the 3rd to allow some of the younger players to develop. The Red Knights won the 5th division title last season and have moved up. Yesterday, the play was frustratingly sloppy. We fumbled, we jumped off sides, our receivers missed blocks and dropped balls. the linemen didn’t communicate, missed assignments. I understand our defense looked bad as well. Bad football is an ugly thing to watch and yesterday was very ugly. But… from looking at the film, the encouraging part was that so many of the mistakes were subtle and easy to correct. A offensive football play is like a precision machine with 11 players and one ball combining for a specific per-arranged plan, all happening in 4 seconds and with 11 defenders violently trying to disrupt and destroy. It doesn’t take much to screw up the works. 10 players can be working beautifully while the 11th jumps early, goes the wrong direction or misses an assignment and the play is a failure. Razorback and Red Knight O-Linemen during morning drills. After a team meal of Schnitzel, German pasta and fries we held an extensive film session and I HOPED that the things we covered would sink in. I’m very aware that some American football expressions may or may not translate, (Will German players understand what “We need more presence on the 1 technique before you climb to the 2nd level?”) So I left yesterday, unsure if I had coached effectively or made a very confusing game even more so. Today was outstanding, we looked like a real football team. Our first three offensive plays were touchdowns. We still made mistakes, but the players usually knew what those mistakes were and quickly corrected them. I feel silly being proud of a group I’ve only known a week. But I am proud of how well and quickly our players learned and adjusted to yesterday. There was no finger pointing or excuses, just the desire to learn and improve. Days like today, watching a plan come together, are what makes coaching so rewarding. Now a few days away from football. I have some fun plans and I’ll write about them in the next post. Razorback players relax after lunch and before film session.